Using ser vs estar is one of the most puzzling aspects of learning Spanish for anyone not used to the concept of having two distinct verbs for to be. Don’t feel discouraged though, every language has more and less difficult parts and the most frequently used verbs are usually also the most irregular. Even in English the verb to be conjugates very irregularly. Not every instance of the English to be can be translated to ser or estar. And those which can be translated may as well be substituted with alternative phrases in most cases. So for the best results focus on translating the meaning, not the words. This article will help you understand how to do it. We don’t like learning by heart so we always look for ways to avoid it. Instead of the usual acronyms and long lists of rules and exceptions, we’ll concentrate first on how to look at this matter from different angles and use logical thinking to decide which verb to use. But if you’re looking for rules, they are presented further on as well. Of course some things just have to be memorized, especially at the beginning. But the more of them we may eliminate the faster and more enjoyable the progress will be. For example, memorizing irregular conjugation forms is necessary, because guessing that soy, era and fui are all forms of the verb ser is not easy. It is worth the effort as these two verbs belong to the most frequently used. Also not every form needs to be memorized because they don’t conjugate irregularly in every tense. Most of the forms may be created following regular rules like in case of the Condicional and Futuro tenses. ¿Estás preocupado por la situación? Are you concerned about the situation? ¿Te sientes preocupado por la situación? Do you feel concerned about the situation? ¿Te encuentras preocupado por la situación? Do you find yourself concerned about the situation? Pareces preocupado por la situación, ¿es así? You seem concerned about the situation, is that right? ¿Te preocupas por la situación? Do you worry about the situation? Does the situation worry you? Hoy.. Por la fiesta.. Porque no pasa nada especial. Today.. By the party.. Because there’s nothing special going on. Ya tengo 18 años así que soy un adulto. I am already 18 years old so I am an adult. The baby is crying because it is hungry. Toma la chaqueta porque hoy hace frío. Take the jacket because it is cold today. So in these examples we see that the verb tener is used when talking about the age, hunger or thirst. The verb hacer is used when talking about the weather. You’ve probably already heard that ser is usually used when referring to something permanent and estar when referring to something temporary. While it is convenient, it is also oversimplified and after making some progress in learning Spanish it becomes confusing and raises many questions. Look at it as a very general tip with many exceptions or simply one of the different points of view. It is more useful to think about what identifies the subject, what are its integral parts versus what state of being the subject is in. Ser is used when describing something that distinguishes the subject from others. It includes physical description, personality or character, what things are made of, race, gender, origin, etc. Estar is used when describing a condition that distinguishes the current state of being of the subject from its other possible states of being. Estoy llorando porque mi conejo está muerto. I’m crying because my rabbit is dead. Es mi conejo / Fue mi conejo. It is my rabbit / It was my rabbit. I can uniquely identify this animal as my rabbit. Es pequeñito y blanco / Fue pequeñito y blanco. It is tiny and white / It was tiny and white. I can identify it by its characteristics, body size and fur color. The state of being it’s now in is called ‘dead’. Pero todavía es mi conejo y gran amigo. But it still is my rabbit and a great friend. Regardless of its state of being I can still identify it as my rabbit and a great friend. Si estuviera vivo ahora estaría saltando por todos lados. If it was alive today it would be jumping all around. If it was in the state of being called ‘alive’ it would surely also be in the ‘jumping’ state of being. No doubt it would prefer that over other states of being, like watching TV or sleeping under the carpet. The first few examples are written in present and past tenses because you could use any of them in reality. It would depend on the context, your mood and what you would like to express. So we clearly see how ser goes with what identifies a man as a man, a rabbit as a rabbit or a thing as a thing. And how estar goes with what describes how they are doing, what is happening to them, what they experience, etc. The next dose of examples describes water which changes its states of matter. Note how ser is used for identification and how estar is used for state description. All refer to water in three different states of matter, just from different points of view. Esto es el vapor. El vapor es caliente y volátil. This is steam. Steam is hot and volatile. We identify the subject as steam and say that its characteristics include being hot and volatile. That’s what differentiates it from water and ice. Esto es el agua. El agua es líquida y transparente. This is water. Water is liquid and transparent. We identify the subject as water and say that its characteristics include being liquid and transparent. That’s what differentiates it from steam and ice. Esto es el hielo. El hielo es muy frío y duro. This is ice. Ice is very cold and hard. We identify the subject as ice and say that its characteristics include being cold and hard. That’s what differentiates it from steam and water. Esto es el agua. El agua ahora está caliente y por eso está en el estado gaseoso. This is water. Water is now hot and because of that it is in gas state. We identify the subject as water and notice what state it is in, what’s happening to it. It now has high temperature and is in gas form. When it loses the temperature it will get back to its usual state. Esto es el agua. El agua ahora está en la temperatura ambiente y por eso está en el estado líquido. This is water. Water is now in the room temperature and because of that it is in liquid state. We identify the subject as water and notice what state it is in, what’s happening to it. It now has so called room temperature so it is in its most usual, liquid state. Esto es el agua. El agua ahora está muy fría y por eso está en el estado sólido. This is water. Water now has very low temperature and because of that it is in the solid state. We identify the subject as water and notice what state it is in, what’s happening to it. It now has very low temperature so it is in ice form. When it gains the temperature again it will get back to its usual state. And even if it was trapped in the center of a huge iceberg and it looked like it would stay there for centuries or forever, our point of view would still be that it is water so we would still use estar to describe its state. Hopefully at this stage the concept of having two separate to be words is much more clear. Maybe you even start seeing how powerful it actually is. It allows these two single words be more than just auxiliary verbs. Ser and Estar may carry so much additional meaning. So if you are not learning it just to pass an exam and forget, you should actually enjoy this idea. Luckily, in most cases, if you choose incorrectly which verb to use you will still be easily understood. What you need to be careful about are the cases where the verb is followed by an adjective. That’s because the meaning of the adjective may be different when used with ser and different when used with estar. We have a longer list of these adjectives, but for brevity it was moved to a separate page: Ser vs Estar – Adjectives changing Meaning. This list also includes example sentences. You can now perhaps do without the need for rules. However, because we recommend looking at the topic from different angles, it’s worth at least getting familiar with them. Be particularly careful with the rules having exceptions. Such rules are usually too general and although using them is convenient, they also tend to cause the most confusion. The list of rules is not short. If you intend to learn them by heart, you may want to use a shortcut. You could first learn only the ones for estar and by elimination use ser in all other cases. Or vice-versa, learn only the ser rules if they seem easier to remember. Todavía estamos en casa pero estarémos en tu lugar en 15 minutos. We are still at home but we will be at your place in 15 minutes. La fiesta es el sábado en la casa de Jorge. The party is on Saturday at George’s house. Note that the most often used preposition in this case is en. It translates to English in, on or at. Alejandro estaba contento porque recibió un buen regalo de su novia. If we thought that Manuel is normally not handsome, then using estar we would express our observation that the suit makes a real, positive difference. If we thought that Manuel is always handsome, we would still use estar to emphasize that it’s particularly true today and thanks to the new suit which we like. Estuve inclinado lavando a mi perro durante demasiado tiempo y ahora me duele la espalda. I was slouched down washing my dog for too long and now my back hurts. The progressive tenses are created using an inflected form of the verb estar and the gerund form of the main verb. Practically any tense can be used for estar to form a progressive, but the Presente (Simple Present) and Imperfecto (Imperfect) tenses are most common. Me parece que Clara está cometiendo un gran error. I think that Clara is making a big mistake. We’d like to say goodbye because we are leaving soon. Querríamos despedirnos porque salimos pronto. NOT: Querríamos despedirnos porque estamos saliendo pronto. Paula es guapa pero ahora está más guapa que nunca. Paula is beautiful but now she is more beautiful than ever. Why is estar used to say that someone is dead, while death seems quite permanent? It was already explained in a previous section, so here we would only like to emphasize again that you should not rely on this rule too much. It’s true that it is very convenient, but use it as the last resort. In the long run, it will do more harm than good to your understanding of the ser vs estar subject. Read the comix, identify all the rules used, which influenced the choice between ser and estar. Transcription with translations and explanations is provided below the comix. - ¡Hola hijo, Mamá aquí! ¿Dónde estás? Estoy preocupada. - Hi son, Mom here! Where are you? I’m worried. - ¡Hola Mamá! 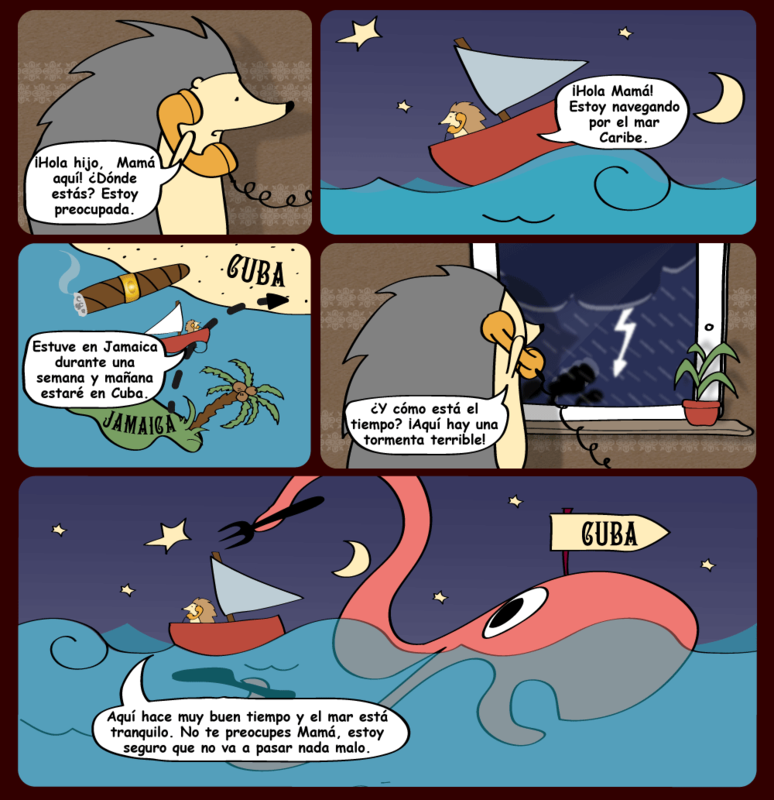 Estoy navegando en el mar Caribe. - Hi Mom. I’m sailing in the Caribbean sea. - Estaba en Jamaica durante una semana y mañana estaré en Cuba. - I was in Jamaica for a week and tomorrow I will be in Cuba. - ¿Y cómo está el tiempo? ¡Aquí hay una tormenta terrible! - And how is the weather? There is a terrible storm here! - Aquí hace muy buen tiempo y el mar está tranquilo. No te preocupes Mamá, estoy seguro que no va a pasar nada malo. - Here the weather is very good and the sea is calm. Don’t worry Mom, I’m sure that nothing bad is going to happen. Note that in Spanish the article is omitted before the name of the profession. Es fantástico poder disfrutar de una vista tan maravillosa. It’s fantastic to be able to enjoy such a wonderful view. En este momento es importante que estés atento a todo lo que pasa alrededor. In this moment it is important that you are aware of everything that happens around. Hoy es el primero de abril y como es tradicional, hacemos chistes. Today is the first of April and in line with tradition, we make jokes. Un año son 525 600 minutos y en año bisiesto son 527 040 minutos. A year is 525,600 minutes a leap year is 527,040 minutes. Also notice that the articles are always used before the hour – es la una, son las tres. Mi coche es reparado por el mecánico. My car is being repaired by the mechanic. Passive voice, ser plus past participle. El mecánico está reparando mi coche. The mechanic is repairing my car. Active voice, estar plus gerund, Present Progressive tense. Mi coche ahora está reparado. My car is now repaired. The mechanic has finished his job and the car is ready. Past participle used as an adjective. We’re describing state so using estar. The most general and most often heard rule for ser is that it is used when describing permanent aspects of things and characteristics that normally do not change, as opposed to estar which is used for temporary aspects. While this rule is true in many situations it is also very general. So it has multiple exceptions and is a frequent source of confusion. We described the case in more detail in the section of the counterpart rule for estar, so please check it if you haven’t yet. Here we would only like to remind you that you should avoid relying on this rule too much, as it may do more harm than good to your understanding of the ser vs estar topic. Read the comix, identify all the rules used, which influenced the choice between ser and estar. Transcription with translations and explanations can be found below the comix. - ¡Hola, Mamá! Tengo un amigo nuevo, es Osito. - ¡Hola, Osito! ¿De dónde eres? - Hi, Osito! Where are you from? - ¡Hola! Soy del bosque y soy leñador. ¿Sabe que nuestro bosque es el más grande en Europa? - Hello! I’m from the forest and I’m a lumberjack. Do you know that our forest is the biggest in Europe? - ¡Si, por supuesto Osito! Y también es el más bonito. - Yes, of course Osito! And it’s also the most beautiful. - ¿Osito puede quedarse para la comida? - Can Osito stay for dinner? - Creo que es demasiado grande para entrar por nuestra puerta. Además es muy tarde, son las 9 y es el domingo. ¿No tienes el reloj? - I think he is too big to enter through our door. Additionally it’s very late, it’s 9 o’clock and it’s Sunday. Don’t you have the watch? - No Mamá, lo perdí en el bosque. - No Mom, I lost it in the forest. - ¿El reloj que era de tu padre? Sabes que es de oro? - The one which was your father’s? Do you know it’s golden? - Era caro pero también era un recuerdo de Papá. ¡Es un desastre! - It was expensive, but it was also a memento of Dad. It’s a disaster! - ¡Así que es importante encontrarlo! - So it’s important to find it! Ser vs Estar – rules or logic? The problem with rules for ser vs estar is that there are quite a few of them and that they have exceptions. And exceptions often lead to confusion. For example there’s a rule that talking about location we use estar. But there’s also an exception that for the location of events we use ser. We could logically analyze it and say that an event cannot be located in the physical sense, because it has no physical form. It either exists or doesn’t exist (before and after it happens). So talking about an event we are talking about its existence or occurrence. We identify it unambiguously stating where and when it exists. And identification is the job of the verb ser. But logical analysis is not ideal either. It’s not always easy and results may be ambiguous. That’s mainly because things we talk about every day have different natures. They may be physical entities, concepts, ideas, metaphors, figures of speech, analogies, symbols, etc. In some contexts we could come up with misinterpretation or multiple interpretations. Should I use estar because logic implies that the location of the bathroom is not its characteristic, doesn’t identify it? It would still be the same bathroom if located on the ground floor. If the whole house was moved by a flood and landed safe somewhere down the river, we would still say that it is our house, just located in a different place. The best approach would be to explore all we talked about so far and treat every tip as a different point of view which is good to understand. Focus on translating meaning, not words. You may find more ways to express a particular meaning than to directly translate a particular sentence. Read, watch and listen. To make fast progress, during the next few weeks whenever you hear or read Spanish focus particularly on catching all the uses of the verbs ser and estar. There’s a lot of free or inexpensive content to read, watch and listen. What you choose depends on your level, but try to regularly digest some stuff which is too difficult to understand for you. Push your limits to expand them. You don’t even have to focus every time. Let it just play in the background while you prepare breakfast. Check your knowledge taking one of the Ser vs Estar tests available in the Spanish Practice Tests section. What is your favorite tip for Ser vs Estar? This is a very large effort to explain a difficult subject. However, I think you need to concentrate on the past tense. WHY? Please note the present has one primary tense so we have ONLY 2 choices. BUT the past has two primary tenses so we do not have just 2 choices but 4 !!!. For example if the student wants to say ‘I was’ he or she is forced to choose between fui, era, estuve and estaba —-awwwwww my head hurts!!! Hey Will! That’s true, but still only up to some level. Then you also get choices like “estuve, estaba, he estado, estuviera or fui, era, he sido, fuera..” These are still used in simple, every day conversations. 1. which verb to use: ser or estar? 2. which tense to use: preterite or imperfect? Both have two choices each. It seems easier to first understand these separately, then practice separately in the present tense and finally practice doing both choices at the same time. Which indeed may make your head hurt :) Later on you will have to add more options to the pool, also the mood. It’s easier to make the choice in several smaller steps: which verb, which tense.. However, that’s definitely a good idea for more articles in the series that would help grasp these various combinations as well. So thanks a lot for the feedback!